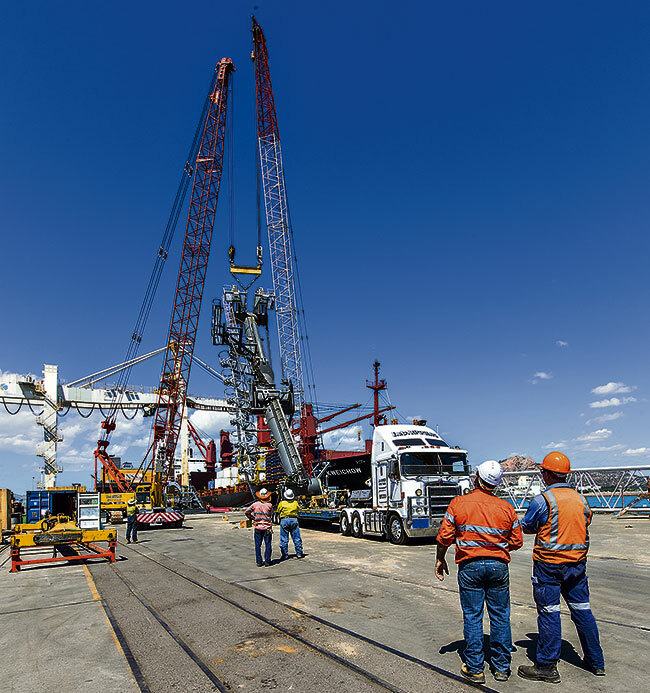 Northern Stevedoring Services continues to invest in the future prosperity of the Port of Townsville, with a $5 million Leibherr 420 harbour crane now working at Berth Three. The purchase follows the completion of a $12 million bulk handling facility adjacent to the port earlier in the year. The crane arrived by ship from Germany in pieces and took more than two weeks to unload, reassemble and commission for its new role at the port. NSS commercial manager Ross Grenside said the Leibherr 420 had a lift capacity of 124 tonnes, a substantial increase of capability over the old harbour crane which had a maximum lift capacity of 80 tonnes. Mr Grenside said the old crane would be retained for the time being as a back-up. NSS customers can expect a 20 per cent lift in ship turnarounds, cutting about four hours off the usual day-long period while unloading. An added advantage of the Leibherr 420 is its boom reach of 44m, which allows it to load and unload larger vessels with a greater width more quickly. Maintenance manager Jarrod Sawyer said the crane had a number of innovative features to increase efficiency and also enhance safety. A Cycoptronic point-to-point system allows operators to program in the arc of the boom, which will automatically compensate for the forward momentum of the load. A remote control system has also been fitted which allows an operator to control the crane from outside the cabin, which is 30m above the ground. Mr Sawyer said this would be used for maintenance work, moving the crane to a new location and in the movement of large project cargo which has very little leeway when being lifted from the hold of a vessel. The crane also features a twin-lift Bromma container spreader which allows for two containers to be unloaded simultaneously. Mr Grenside said he had been speaking with port officials about spreading the word about the increased loading and unloading capacity at the Port of Townsville. “We are speaking with shipping companies that operate vessels which don’t have onboard cranes to look at Townsville as a possible destination,” he said. NSS Port of Townsville from Roslyn Budd on Vimeo. The largest crane north of Gladstone was under construction at Townsville Port recently. Northern Stevedoring Services (NSS) are the team responsible for the assembly of the Liebherr LHM 420 Mobile Harbour Crane. The timelapse video above shows the attachment of the tower to the slewing platform and undercarriage – a small part of the overall process. The consultation process for the project began in July 2013 and final approval granted in February 2014. The crane will be used for the loading and unloading of vessels with products such as containers, bulk products and concentrates with the Rota-box spreaders and grabs.